Proper water safety practice is essential for ALL people who come in contact with or are near any body of water. This includes residential and public swimming pools, bath and hot tubs, baby pools, lakes, streams, canals, rivers, and the ocean! Recreational swimming has become tremendously popular since late in the nineteenth century up to the present time. Swimming pools are everywhere you look these days! Drowning is a global public health problem. It is actually a leading cause of death in nearly every country. The number of drowning-related injuries and deaths in the United States is shockingly high. Drowning is the third leading cause of death among children in the United States. Florida, overwhelmingly, has the highest unintentional drowning rate in the nation for the 1- to 4-year old age group, with a drowning rate of 7.29 per 100,000 in the population. Drowning is the leading cause of injury-related death among children between the ages of 1 and 4 years old. A baby can drown in one inch of water. A child can drown in only two inches of water. Every day, 10 people die from unintentional drowning, of which two of those people are under the age of 14. Barriers are essential for keeping children away from unattended pools. Make sure your children know and understand the pool rules. Keep all toys away from the pool area when not in use or when you are finished using them this will help to keep a child from being drawn to the pool to play. Get children in swim lessons as soon as possible. Make sure children know how to tread water and float (survival skills). Never leave a child unattended around or near water, and keep them within an arms’ reach at all times. Choose sites that have lifeguards. Enforce the buddy system. Most importantly: Give your child 100% of your attention; PUT YOUR CELL PHONE AWAY! There are many untapped resources in our community that could prevent these unnecessary deaths. The YMCA of the Treasure Coast has many options for teaching children and adults how to swim. 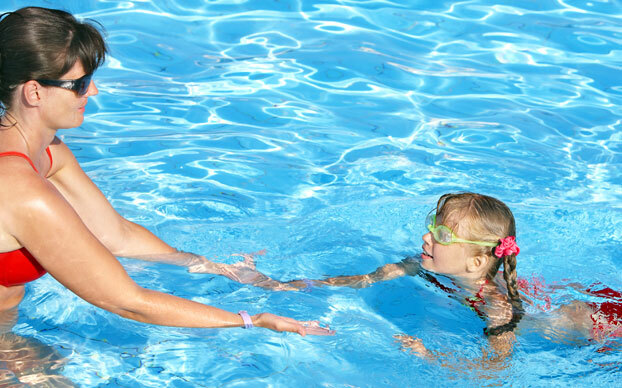 From as young as 6 months of age, the YMCA introduces children to water safety techniques. As the children grow, the YMCA broadens their spectrum in water safety, from survival skills to stroke techniques (i.e., free, back, breast and butterfly). A few of the programs that the YMCA offers are parent/child classes, starting with babies ages six to 36 months, as well as beginner classes that are offered for children through adults, starting at 3 years of age. Group swim lessons start from beginner and go all the way through advanced stroke techniques, leading up to our Competitive Recreational and Masters Swim Team. So go ahead…. Get out there and have fun. Remember, most of all, BE SAFE! Is there a listing number for the product ? ASTM, etc. Has the Building Code community accepted this product as meeting the pool barrier provisions in the California Building Code? The pool shall incorporate removable mesh pool fencing that meets American Society for Testing and Materials (ASTM) Specifications F 2286 standards in conjunction with a gate that is self-closing and self-latching and can accommodate a key lockable device. 1. Any access gates through the enclosure open away from the swimming pool and are self-closing with a self-latching device placed no lower than 60 inches (1524 mm) above the ground. 2. A minimum height of 60 inches (1524 mm). 3. A maximum vertical clearance from the ground to the bottom of the enclosure of 2 inches (51 mm). 4. Gaps or voids, if any, do not allow passage of a sphere equal to or greater than 4 inches (102 mm) in diameter. 5. An outside surface free of protrusions, cavities or other physical characteristics that would serve as handholds or footholds that could enable a child below the age of five years to climb over. Please visit https://protectachild.com/pool-fence-certifications for more information regarding our certifications.